Microsoft, Intel and Nokia are some of the companies whose 'sonic logos' are catching your ear. BOSTON (TheStreet) -- "Two all-beef patties, special sauce, lettuce cheese ..."
"Plop plop, fizz fizz, oh what a relief it is ..."
"I wish I were an Oscar Meyer Weiner ..."
No matter how many custom ringtones and MP3 files we cram onto our hand-helds, one sound still persists as the definitive cell phone ring -- the Nokia tone. Music is a memory trigger, something companies have understood for years, pumping out catchy jingle after jingle to extol the virtues of their products. No less a song master than Barry Manilow has composed dozens of stuck-in-your head ads for McDonald's ( MCD - Get Report), State Farm, KFC ( YUM - Get Report), Dr Pepper ( DPS and Band-Aid. Now corporate America is vying for your ears in a new way. Audio branding, also called sonic branding, is an increasingly popular marketing and branding tool that uses carefully crafted sounds, songs and effects to add to company aesthetics and mnemonics. It goes far beyond the old-school approach of merely plinking out an ode to snack cakes on a piano. "Audio logos" are hardly new. Certain sounds immediately make you think of a particular company or product: Intel's ( INTC - Get Report) dinging bongs, Apple's ( AAPL - Get Report) start-up chime, the ever-present Nokia ( NOK - Get Report) ringtone. The modern twist is the full and intentional strategy that goes into these creating sonic backdrops. Audrey Arbeeny is owner and executive producer of Audiobrain, a New York company specializing in sonic branding. It has worked with McDonald's, won an Emmy for its music supervision for NBC's Beijing Olympics broadcast and created the start-up sound for Microsoft's ( MSFT - Get Report) Xbox 360. For Arbeeny, sonic branding is all about "bringing consistency of experience and authenticity to the voice of the brand." The music or sound portion of their service is actually one of the final steps in the process, coming after a blueprint of a company's identity, strategy and competitive landscape is laid out. "We don't one-off anything," she says. "We wouldn't be a company somebody would call to just demo a commercial." The increasingly complex modern business landscape and rapidly evolving nature of media and technology makes having a full audio strategy very important, Arbeeny says. "The audience has so many places where that brand is touching them sonically," she says. "You have apps. You have anything having to do with mobile. You have products going inside of other products, such as Pandora getting their music selections based on your Facebook friends. There is such a cross-pollination, and you need people to know you are in there." "A lot of people think it is just a logo, but it is more than that," she says of a managed, scalable and consistent audio strategy. "It is the voice that's on hold. It is the music that's on hold. It's the voice that answers your call center. It is what's playing, or not, on your website. It is what's happening at your conferences and at your exhibit booths." The Xbox project is an example of how a well-crafted audio logo can accomplish multiple goals. Among the intentional flourishes was adding a "human breath at the end." "Their sweet spot at the time was Xbox Live and the human interaction," she says, "that they were not a gaming console, but a 'living entertainment system powered by human energy.' The way it is crafted, you can hear it in a theater in surround sound and you can also hear it as a sonic fingerprint at the end of an EA ( ERTS game commercial where it's there for just a split second." What follows is a selection of sounds that have become synonymous with their companies over the years, as well as the stories behind them. A simple, three-note, xylophone chime is as much a part of television network NBC's pop culture identity as its "in living color" peacock. NBC wasn't the first to use such a sound as a station identifier. In the 1920s, radio station WSB in Atlanta, owned by the Atlanta Journal newspaper, is believed to be the first to use a dinner chime (a then popular way to summon diners on cruise ships, railroad cars and wealthy households) as part of its mandated, top-of-the-hour station identifications. As NBC's network of stations grew national in scope, well-known radio announcer Phillips Carlin is widely credited as bringing such chimes coast-to-coast as part of the company's sonic hook. A popular but unsubstantiated myth about the order of the notes, G-E-C, is that they were a musical shout out to the General Electric Corp. ( GE - Get Report). Over the years, the network has experimented with variations of the familiar tones, including four-, five- and seven-note variations. In 1950, with a first-of-its-kind filing, NBC secured a parent for the musical hook as an "audible service mark." The network stopped using the notes in promos In 1971 but brought them back in 1976 as part of a 50th anniversary celebration. Since that time, the ditty has once again become ubiquitous. An in-depth history of the famous bongs can be found at RadioRemembered.org and NBC Chimes Museum. In 1988, the Austrian band Eelweiss scored a best-selling dance single (No. 1 on European charts) with Bring Me Edelweiss, a frenetic mash-up of ABBA's SOS and Indeep's Last Night a DJ Saved My Life, layered with a healthy dose of yodeling and cowbell. Walter Werzowa, a member of the band, scored a much bigger "hit" with a much shorter tune a few years later: the three-second, four-note (five, if you count a chime that precedes the main melody) "Intel Bong," as it is known. Since 1994, by Intel's reckoning, the "song" has been played more than a billion times worldwide, making it among the most heard tunes in history. The proceeds from Edelweiss' success prompted Werzowa to move to Los Angeles. When a friend working on an ad campaign for Intel tapped him to tackle a musical hook, the result was a corporate branding phenomena (even though its architect claims that, as a Mac user, he had never heard of the company). Each year, hundreds of millions of dollars are spent by Intel on commercials that incorporate the song (a recent version performed a cappella by "employees") and to subsidize its inclusion in ads by various computer manufacturers. Werzowa has parlayed the success of the Intel tune to found the L.A.-based music production studio Musikvergnuegen. In addition to composing music for films and television (including Arnold Scharzeneggers' Eraser) he has been active in the field of sound branding, which he describes on the site as "mnemonics," for such clients as Verizon's ( VZ - Get Report) FiOS, Avaya and ESPN's 2010 World Cup coverage. If you spend any time at the cinema, you've undoubtedly heard what is known as "Deep Note," the signature sound of the THX sound system that equips better theaters. The company, part of Lucasfilm, introduced its building crescendo (think of it as a high-tech brethren to the final, interminable piano thud in The Beatles' Day in the Life) with the 1983 release of Return of the Jedi, and variations have kicked off a night at the movies ever since. The sound was the creation of Dr. James Moorer, an Oscar- and Emmy-winning sound engineer. From 1980-87, he was vice president of research and development for Lucasfilm DroidWorks, where he developed the Audio Signal Processor, a large-scale digital signal processor. Only one prototype was ever built, but sounds processed by the ASP were used in a variety of Lucasfilm productions. In an interview with the website MusicThing, Moorer said the desire was to craft, in the words of a producer, "something that comes out of nowhere and gets really, really big." Doing so used the ASP and required tens of thousands of lines of computer code, the waveform from a digitized cello tone and a slew of harmonic and oscillation effects. The sound has taken its place in the pop culture lexicon, sampled by rappers (including Dr. Dre, who was sued for his appropriation) and parodied by such diverse sources as Sesame Street and Tenacious D.
Not every effort to craft a sonic brand is successful. Back in 2007, Mercedes-Benz, as part of an effort to revamp its image, launched an operatic "acoustic trademark" with an ad campaign for its E-Class vehicles. In a press release at the time, the company's vice president of brand communications said: "Our new sound logo is going to make the Mercedes-Benz brand not only visually, but also acoustically distinctive, and thus more quickly recognizable. This acoustic trademark is a perfect fit for Mercedes-Benz -- it is emotional, elegant and unmistakably associated with our brand." The Mercedes-Benz sound logo was based on an original recording of an English boys choir from the 1990s, the company explained. Sound engineers extracted a choir boy's solo vocal from the recording and adapted it for use in the sound logo. Two years later, Mercedes did an about face and yanked the logo, offering a rather weak response that the decision was made because, in essence, its brand is so strong that it didn't need any help. Dating back to the Quadra 700 in 1991, the familiar Mac start-up chime has been a component of the Apple experience (at least on desktops; it is conspicuously absent from iPhones, iPods and iPads). Though variations on the start-up sound existed before, the noise most are accustomed to was composed and recorded by Jim Reekes, a programmer and driving force behind System 7, Quicktime and a slew of system sounds. The C Major chord, bursting with low bass and a chiming crescendo, has been described by its maker as a "palate cleanser" of sorts. It was not just meant to be aesthetically pleasing when you hit the power button, but to be reassuring when a crash forced a restart. When the company parted ways with Steve Jobs in the 1990s, it also veered away from the familiar chime. Among the moves made by Jobs when he returned to the company in 1997 was that the sound would once again take its rightful place across the entire line of desktops. ESPN's Sports Center theme, a full musical piece, has been distilled into just a handful of notes over the years. In doing so, it has evolved from a theme song and jingle into a sound bite synonymous with the network. It's a constant presence on the network's channels, and it's difficult to watch a college game where the catchy jingle doesn't get a brassy treatment by the marching bands. The catchy tune was composed by Annie Roboff, an award-winning songwriter behind hits by Faith Hill, Whitney Houston, Bonnie Raitt, The Indigo Girls, Tim McGraw and The Dixie Chicks. In addition to her radio-friendly efforts, Roboff has had an illustrious career writing and arranging themes for sports and news shows and TV movies. Her credits include college football themes for ABC ( DIS - Get Report), CBS ( CBS - Get Report) and TBS ( TWX, the 1984 Olympics and ABC's broadcast of Prince Charles and Lady Diana's Wedding. Included in her resume was the Sports Center theme -- except that isn't what it started out as. The song was composed for the Satellite News Channel, a would-be CNN competitor co-owned by ABC and Westinghouse Broadcasting. After its speedy demise, its musical asset was sold to the fledgling sports network, now owned by Disney. No matter how many custom ringtones and MP3 files we cram onto our hand-helds, one sound persists as the definitive cell phone ring -- the Nokia tone. But for something that has become synonymous with modern telecom, the tune itself is quite ancient. It dates back to 1902 and was a snippet from a composition, Gran Vals, by Spanish classical guitarist Francisco Tarrega. The company introduced it as one of 27 ringtones included with 1994's Nokia 2100 series. With Gran Vals used to score a TV commercial at the time, the company did its best to promote the piece as part of its brand identity. The monophonic ringtone became a global phenomena because of the tremendous success that phone had. 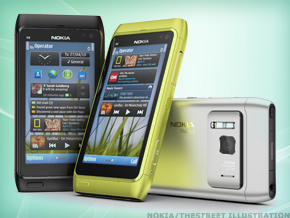 Nokia's target for the model had been 400,000 units; more than 20 million were actually sold. Despite its origins, Nokia managed to trademark the stuck-in-your head tune.